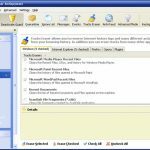 Spyware Browser Antispyware, formerly known as No-Spy, is a powerful, comprehensive spyware remover, which uses advanced malware removal technique and implements effective real-time protection. We have carefully tested the program on several computers including absolutely clean machines and PCs infected with different parasites. 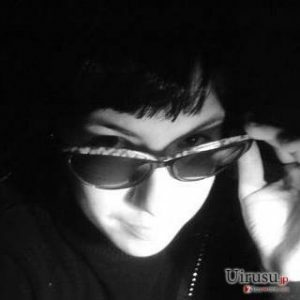 Spyware Browser Antispyware passed all our tests and produced fine results. The application thoroughly checks the Windows registry, running processes, web browser cookies and the entire file system. The user can choose between four scan modes: Smart Scan, Quick Scan, Full System Scan and Custom Scan. The first one is the fastest, but quite facile. It takes a little bit more than one minute, and checks essential system components. Quick Scan is much more useful. It takes up to 10 minutes, but allows the program to check all system folders and files, not only scan for known infections. Full System Scan is similar to Quick Scan. However, it allows examining each file and folder in the file system. It is the most thorough mode that may require more than one hour to complete. 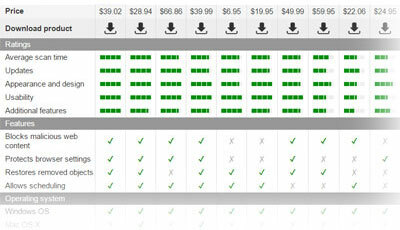 Spyware Browser Antispyware also allows the user to specify custom scan options and perform custom scans. Such scans can be less thorough, but sometimes even more effective than default modes. However, the user should know which kinds of threats to search for. Scan results are informative. The program provides exact parasite location, all the related objects and severity scale. Unfortunately, we did not see any descriptions. 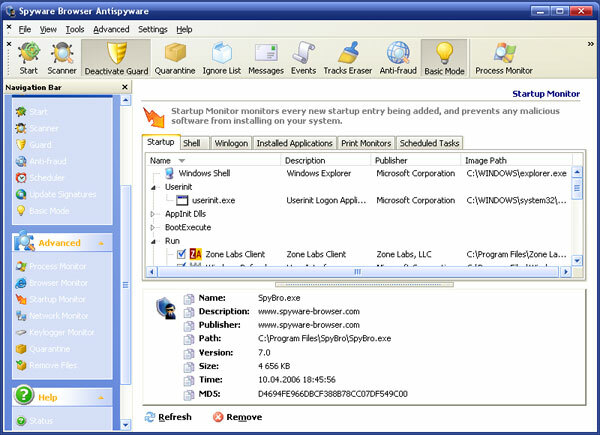 Spyware Browser Antispyware implements reliable real-time protection. 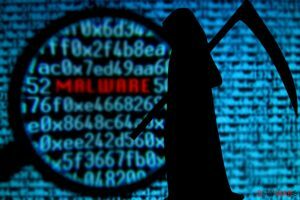 The program monitors the system for running malicious processes, malware installation attempts, browser hijacks, active keyloggers and other unsolicited software. It automatically blocks and eliminates detected threats. The application comes with additional tools for user privacy protection. 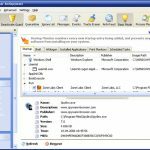 Keylogger Monitor allows the user to review and uninstall the applications that log keystrokes and track user activity. Anti-fraud, another tool prevents access to malicious web sites, which may be masquerading as legitimate commercial or business resources. The program provides more additional utilities. 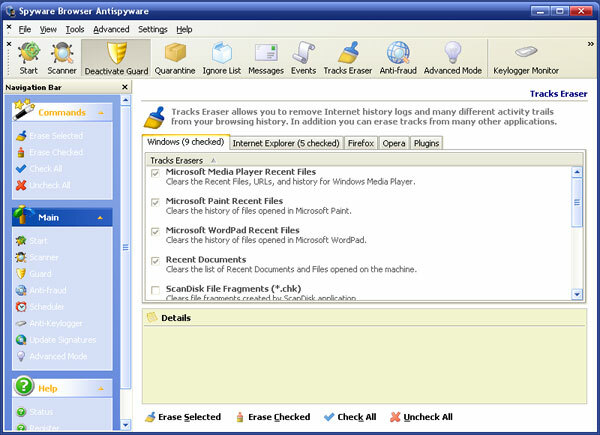 Tracks Eraser allows the user to erase numerous Internet activity tracks, software cache and system history. Process Monitor, Browser Monitor, Startup Monitor, Network Monitor and Keylogger Monitor are related to real-time protection. These helpful utilities can be used to view details of running processes, services, system components, startup entries, installed applications, browser plug-ins, networking components, etc. Other program tools are Quarantine, Ignore List, Messages, Events, Scheduler. The application’s interface is overcrowded with duplicated controls, but still looks fine. It is quite convenient and balanced. 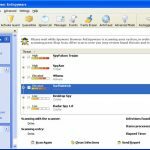 Spyware Browser Antispyware has four localized versions: Sin Espias (Spanish), Spionfrei (German), Senza Spie AntiSpyware (Italian) and Sans-Espions (French). Domains associated with Spyware Browser Antispyware and its localized versions are spyware-browser.com, no-spy.com, sin-espias.com, spionfrei.com, spionfrei.de, senza-spie.com and sansespions.com. Orders are made via reputable services using secure connection. This entry was posted on 2014-05-20 at 09:12 and is filed under Anti-Spyware, Software.